Yamarz is an Orc warrior and the chief of the accursed Orc stronghold of Largashbur, located in the Rift, east of Avanchnzel. He is generally unpleasant and displays many traits not normally associated with Orcs such as a conniving nature and an aversion to battle. It is never fully explained why Malacath cursed his tribe, but its implied that its Yamarz's weaknesses as leader are a reflection of the curse itself. This would help explain why Malacath charges Yamarz alone with the task of slaying the leader of the giant tribe that has defiled his shrine. Yamarz is clad in a complete set of Orcish equipment. This includes the cuirass, a pair of gauntlets, a pair of boots, and a helmet. 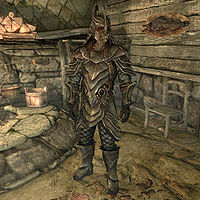 He is equipped with a leveled war axe and a leveled shield, both of which can be up to Orcish quality. This page was last modified on 5 March 2014, at 10:10.